Bicycle rentals Promahonas - Kulata, bicycle hire Promahonas - Kulata. The most convenient and cost effective way to RENT A BICYCLE IN PROMAHONAS - KULATA, GREECE. We offer a wide range of bicycles for rent via Motoroads.com - mountain bikes, city bicycles, touring, racing, city, hybrid, ladies, electric and bicycles for kids. Our Promahonas - Kulata bicycle rental fleet in Greece is built of reasonably priced new and used bicycles available at low rental rates. All kind of professional bicycle gear, accessories and equipment rental is available upon request in order to make your cycling adventure pleasant and safe. Being long in the cycle hire service, we know what you expect from us, and how to treat you. Bicycle rental in Promahonas - Kulata. Our rental fleet consists of ON-ROAD, XC [cross-country] or MTB [mountain] bicycles. 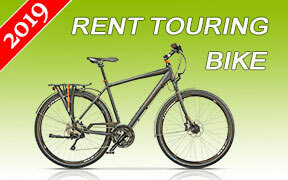 Booking online a bicycle for rent in Promahonas - Kulata is quite easy and takes a minute. If you wish we will deliver the bicycles to the place you stay in Promahonas - Kulata. Renting an on-road, cross-country or MTB bike is probably the best way to experience Promahonas - Kulata and Greece. Upon bicycle collection, we will give you friendly road and map orientation. Promahonas border checkpoint is the Greek counterpart of the Bulgarian main border crossing point with Greece, Kulata, and is located 110 km from Thessaloniki, 70 km from Blagoevgrad and 200 km from Bulgaria’s capital Sofia. The Thessaloniki - Promahonas transport axis is part of the Patra - Athens - Thessaloniki - Promalion transport link and of the first-class European route E79 that connects Sofia with Thessaloniki and West Europe with Greece. If you are entering Bulgaria by land, crossing the border at Promahonas, Motoroads offers its customers safety, reliability, insurance coverage, and 24/7 support when it comes to car hire services in Promahonas. And if you pre-book your hire car in Promahonas before heading to Bulgaria, you can save considerably. So no matter, if you plan a ski vacation in the world-famous winter resorts in the southwest region of Bulgaria or just want to explore its cultural and historical landmarks or simply need a quality car hire service immediately before entering Bulgaria from Greece, we will be glad to organize your car hire in Promahonas in a fast and secure manner. Simply, take advantage of our user-friendly and feature-rich online car hire reservation and booking system to get exact Promahonas car hire quotes and make instant online reservations with just a few clicks. Contact us for our bicycle rental services in Promahonas - Kulata.